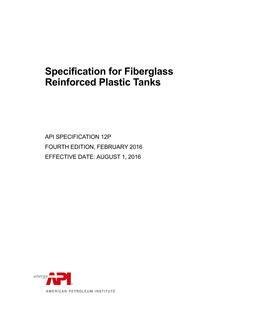 API Spec 12D covers material, design, fabrication, and testing requirements for vertical, cylindrical, aboveground, closed-top, welded steel storage tanks with internal pressures approximately atmospheric at various sizes and capacities, ranging from 500 to 10,000 barrels. 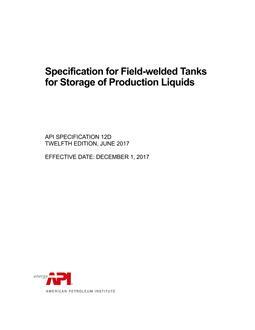 Tanks covered by this specification have been designed using established engineering calculations to determine minimum metal thickness and bolting specifications for each size tank filled with water. This specification is designed to provide the oil production industry with tanks of adequate safety and reasonable economy for use in the storage of crude petroleum and other liquids commonly handled and stored by the production segment of the industry. This specification is designed to provide the oil production industry with tanks of adequate safety and reasonable economy for use in the storage of crude petroleum and other liquids commonly handled and stored by the production segment of the industry.